A photo from the $77.8 million Canada First Research Excellence Fund U of S anouncement in 2016. From left: PhD student Holly Anand; John Pomeroy, Canada Research Chair in Water Resources and Climate Change; Karen Chad, vice-president, research, Hon. 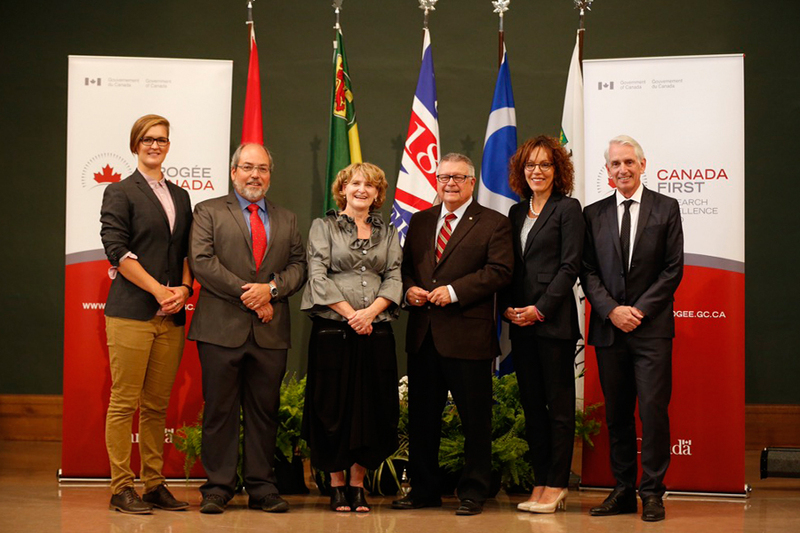 Ralph Goodale, Minister of Public Safety and Emergency Preparedness; Bettina Hamelin, vice-president of partnerships, NSERC; and Peter Stoicheff, U of S president. The annual GIWS Progress Report outlines the collective progress of the institute and our members. The annual GIWS Progress Report celebrates the remarkable journey and achievements of the institute over the last 6 years and outlines the collective progress of our members. A major development in 2016 was the award of a $77.8 million grant from the Canada First Research Excellence Fund (CFREF) to lead "Global Water Futures: Solutions to Water Threats in an Era of Global Change", a transdiciplinary iniative that may be the largest university-led water research program ever funded worldwide. With partner funding, the program budget is $143.7 million over seven years. GWF involves more than 380 Canadian university researchers at 18 universities, 19 federal and provincial agencies, seven Indigenous communities and governments, 39 industrial collaborators, 15 non-governmental agencies and 45 international research institutes. During 2015-16, GIWS has financially supported 57 graduate students (30 PhD and 27 Masters), 30 postdoctoral fellows, 39 research assistants, 13 research associates and scientists, and 11 visiting scholars. In addition, its members have supported a further 166 graduate students (62 PhD and 104 Masters), 25 postdoctoral fellows and research associates, 6 research scientists, 31 Research Assistants, Research Engineers and Summer Students, and 11 visiting scholars. In 2015-16, GIWS faculty members have secured a total of $90 million (93% from federal sources and 2% each from the provincial, industry and international sources, respectively). Since March 2011, GIWS membership has secured a total funding of $158 million (including the CFREF $77.8 million) on top of the original $30 million CERC investment (GIWS grant total is $188 million over 6 years). In 2015-16, GIWS members published 304 journal articles, published and presented 235 papers in proceedings and at conferences, delivered 151 plenary, key note and invited lectures, and published 14 book chapters and books. Since 2011, GIWS members have published a total of 1019 journal articles and 57 books/book chapters, participated in 789 conference proceedings and presentations and delivered more than 412 invited, key-note and plenary lectures to share research outcomes and enlighten our stakeholders and scientific community.